The first ever Etruscan pyramids have been located underneath a wine cellar in the city of Orvieto in central Italy, according to a team of U.S. and Italian archaeologists. Carved into the rock of the tufa plateau –a sedimentary area that is a result of volcanic activity — on which the city stands, the subterranean structures were largely filled. Only the top-most modern layer was visible. “Within this upper section, which had been modified in modern times and was used as a wine cellar, we noticed a series of ancient stairs carved into the wall. They were clearly of Etruscan construction,” David B. George of the Department of Classics at Saint Anselm, told Discovery News. As they started digging, George and co-director of the excavation Claudio Bizzarri of the Parco Archeologico Ambientale dell’Orvietano noted that the cave’s walls were tapered up in a pyramidal fashion. Intriguingly, a series of tunnels, again of Etruscan construction, ran underneath the wine cellar hinting to the possibility of deeper undiscovered structures below. After going through a mid-20th century floor, George and Bizzarri reached a medieval floor. Immediately beneath this floor, they found a layer of fill that contained various artifacts such as Attic red figure pottery from the middle of the 5th Century B.C., 6th and 5th century B.C. Etruscan pottery with inscriptions as well as various objects that dated to before 1000 B.C. Digging through this layer, the archaeologists found 5 feet of gray sterile fill, which was intentionally deposited from a hole in the top of the structure. “Below that material there was a brown layer that we are currently excavating. Intriguingly, the stone carved stairs run down the wall as we continue digging. We still don’t know where they are going to take us,” Bizzarri told Discovery News. The material from the deepest level reached so far (the archaeologists have pushed down about 10 feet) dates to around the middle of the fifth century B.C. “At this level we found a tunnel running to another pyramidal structure and dating from before the 5th century B.C. which adds to the mystery,” George said. Indeed, the Etruscans have long been considered one of antiquity’s greatest enigmas. A fun-loving and eclectic people who among other things taught the French how to make wine, the Romans how to build roads, and introduced the art of writing to Europe, the Etruscans began to flourish in Etruria (an area in central Italy area that covered now are Tuscany, Latium, Emilia-Romagna and Umbria) around 900 B.C., and then dominated much of the country for five centuries. Known for their art, agriculture, fine metalworking and commerce, they started to decline during the fifth century B.C., as the Romans grew in power. By 300-100 B.C., they eventually became absorbed into the Roman empire. Their puzzling, non-Indo-European language was virtually extinguished and they left no literature to document their society. Indeed, much of what we know about them comes from their cemeteries: only the richly decorated tombs they left behind have provided clues to fully reconstruct their history. The subterranean pyramids in Orvieto could offer a unique insight into this civilization as the structures appear to be unique. “The caves have indeed a shape unknown elsewhere in Etruria,” Larissa Bonfante, professor emerita of classics at New York University and a leading expert on the ancient Etruscans, told Discovery News. According to Bizzarri, there are at least five Etruscan pyramids under the city. Three of these structures have yet to be excavated. “Clearly, they are not quarries or cisterns. I would say that there is nothing like these structures on record anywhere in Italy,” Bizzarri said. According to George, the underground pyramids could represent some sort of a religious structure or a tomb. In both cases, it would be a discovery without precedent. “Most likely, the answer waits at the bottom. The problem is we don’t really know how much we have to dig to get down there,” Bizzarri said. Ministers have been condemned for forcing through the sale of up to 1,000 antiquities allegedly stolen from Italy, in order to pay the debts of a bankrupt private collector. The Home Office has sparked outrage by allowing Roman bronzes, Etruscan gold and other treasures to be placed on the market by liquidators acting for the government in an attempt to recover unpaid taxes from the former owner, Robin Symes, a dealer with alleged links to the smuggling trade and a UK prison record. Lord Renfrew, a Cambridge archaeologist, described the handling of the case as a “scandal” and called for action to end London’s reputation as “a clearing-house for looted antiquities”. The controversy comes after officials from 20 countries met last week in Egypt to discuss how to recover ancient treasures that may have been stolen or looted. Britain has been involved in long disputes with Egypt and Greece over artefacts held in the British Museum. In documents seen by the Observer, Paolo Giorgio Ferri, the relevant prosecutor in Rome, has repeatedly asked Britain to return the Symes antiquities to their “rightful owner”. The UK government has caused fury by stating that the antiquities could instead be bought. Renfrew said: “These illicitly exported objects are being sold to pay Robin Symes’s debts, which means that they are being sold for the benefit of the British government. This does reflect unfavourably on the British Treasury and Revenue and Customs, as they are encouraging the sale of material that the Italians say is looted. The Italians said that requests to the Home Office asking for details on how the antiquities arrived in Britain, which must be given under international law, have been frustrated by “unhelpful”, delaying responses. For its part, the Home Office has asked Italy for evidence that the artefacts “were in fact stolen”. 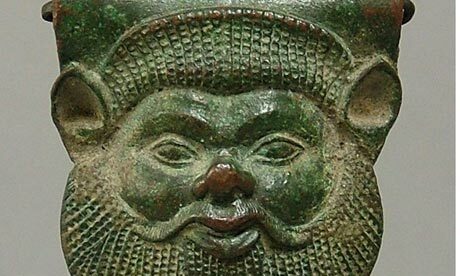 The Symes treasures include Etruscan gold and amber necklaces, lead figures of warriors and a bronze mask of Acheloos, a river deity. There is also an Attic cup decorated with dolphins and a Roman bronze statuette of a bull. Many are still soil-encrusted, a sign of recent illegal digs, according to the Italians. Some belong to important known pieces in Italy and offer “evidence” of smuggling. One of the fragments with the liquidators comes from a looted vase that has been returned to Italy by the Getty Museum – “an absurd situation”, as they belong together, Ferri said. The collection is expected to raise well over £100,000. 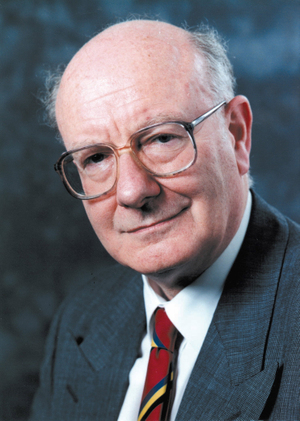 A controversial figure, Symes built up a dealing company once valued at £125m. Selling antiquities to collectors and museums, including the Getty in Los Angeles, he lived a life of luxury. He went bankrupt after a legal dispute with the family of his late business partner. Aged 65, Symes was sentenced to two years in prison in 2005 by a high court judge. The liquidator, BDO Stoy Hayward, declined to comment. A Home Office spokesman said its policy is “to neither confirm nor deny the existence of a request to the UK, or to comment [on it]”. During the Classical and Hellenistic periods (470-300 BC and 300-31 BC, respectively), the Etruscans’ economic power, political autonomy, and distinctive cultural identity gradually eroded, until the Etruscans no longer existed as a separate people. During the Classical period the Etruscan cities engaged in a series of conflicts over sea and land, which ultimately weakened their economic and political significance in Italy. At the end of the Classical period, the Roman Republic emerged as the preeminent threat to the autonomy of the Etruscan city-states. In 396 BC the first Etruscan city, Veio, fell to the Romans after a brutal ten-year siege. With the Battle of Sentinum in 295 BC, between Rome and the Quattuor Gentes (an alliance of Samnites, Gauls, Umbrians, and certain Etruscans), Rome gained supremacy over the entire Italian peninsula. After 270 BC relations were largely peaceful between the Etruscans and Romans. Rome began to colonize southern Etruria in the third century BC. During the second century BC the Romans built the via Aurelia, via Clodia, and via Cassia, roads that provided them with communication and control over all of Etruria. By the first century BC Etruria was no longer a separate entity, politically or culturally; instead, it was part of the growing Roman state. In 89 BC all residents of Etruria were given Roman citizenship and registered in Roman tribes for bureaucratic and voting purposes. By the end of the first century BC Etruria for the most part was Latin speaking and assimilated into Roman culture. The conflicts of the Classical and Hellenistic periods (the fifth to first centuries BC) affected the Etruscan city-states differently. Whereas many Etruscan cities in the south were hurt by the maritime and territorial wars, other cities in the north continued to thrive. Volterra was minimally affected by the upheaval during late Etruscan times. The Hellenistic period was, in fact, a time of great urban development and renovation. Public works-including roads, agricultural terraces, city walls, and religious and civic structures- allowed settlement in the Volterra on a far greater scale than before. The city walls, begun during the late Classical period, were completed during the Hellenistic period. The city also was provided with terracing walls, a sewer, and a drainage and canal system. Hellenistic period Volterrans created lavish tombs for their dead in the cemeteries surrounding the city. The Inghirami Tomb from the Ulimeto necropolis, in use from the early second century to the mid-first century BC, includes several elaborately carved alabaster ash urns, a local artisanal product. The tomb is reproduced in the garden of the Archaeological Museum in Florence. Although the Etruscans ceased to exist as a distinct culture in the first century BC, their people and ideas remained essential to life in central Italy. Etruscans-now Roman citizens-were integrated into the politics, economics, culture, and society of Rome. A few specifically Etruscan contributions to Roman institutions remind us of their presence in later times. The symbols of Roman office-the fasces (bundled and tied rods with a projecting axe) and the curule (a folding chair)-are derived from Etruscan examples. The Romans adopted rituals of military triumph from the Etruscans. The Roman toga originated as the Etruscan mantle. And many of the most famous architectural and engineering feats of the Romans- houses, temples, tombs, roads, bridges, and sewers-were first achieved in Italy by the Etruscans. Banti, Luisa. Etruscan Cities and Their Culture, 1973. Barker, Graeme, and Tom Rasmussen. The Etruscans, 1998. Boëthius, Axel. Etruscan and Roman Architecture, 1970. Brendel, Otto J. Etruscan Art., 1995. Cornell, T. J. The Beginnings of Rome: Italy and Rome from the Bronze Age to the Punic Wars, c. 1000-263 BC. 1995. Haynes, Sybille. Etruscan Civilization: A Cultural History. Macnamara, Ellen. The Etruscans, 1991. Etruscan city-states were autonomous and had their own sociocultural institutions, spheres of influence, and political and economic institutions. Etruscan political organization was generally oligarchic, with important families controlling the territory of individual city-states. A patron-client system linked families within cities and between cities and the countryside. During the Archaic period the Etruscans expanded beyond their traditional boundaries, in order to establish new commercial bases. They colonized land as far south as Campania, as far north as the Po valley, and east to the Adriatic coast of Italy. Roman annalists report that the Tarquin dynasty of Etruscan kings was established in Rome throughout much of the Archaic period, from 616 to 509 BC. Many of these colonized lands were lost during the Classical period. During the Archaic and Classical periods, Etruscan towns developed into city-states – urban centers surrounded by regional territories. In Volterra the process of urbanization is visible in increasing settlement density and in the expansion and reorganization of urban space, including the development of public works, places, and cults. A great wall circuit was begun during the Classical period, with a perimeter of 7 kilometers enclosing an area of 116 hectares. Traces of the wall are still visible at numerous points, including the city gates of Porta all’Arco and Porta Diana. A network of roads connected the foothills and valley bottom to the city. Excavations at Acquarossa, in southern Etruria, provide evidence for domestic architecture during the Archaic period. Houses were rectangular, built on stone-block foundations. The walls usually were built of sun-dried mud bricks, supported by a wooden framework, covered with plaster, and painted. Roofs were made of terra-cotta tiles and decorated with statues and other terra-cotta ornaments. The floor plan often included a larger central room in front and two or three smaller rooms in the back. Sometimes a porch protected the doorway. The house interior was used for sleeping, protection from bad weather, and storage of tools and foodstuffs. The adjacent outdoor courtyard was where most daily activities took place. Storage spaces and shelters for cattle were carved into rock outcrops next to the houses. Archaic Acquarossa also included one monumental residential building complex constructed after the mid-sixth century: two buildings laid out in an L-shaped plan, with a large courtyard. The complex boasted a portico in front and revetment plaques on the facade, with scenes of banquets, dancing, warfare, and mythical events. Marzabotto, an Etruscan colony established in northern Italy at the beginning of the fifth century, was laid out on a regular plan-similar to that of Greek colonial towns and quite different from the plans of settlements that developed through time, such as Volterra and Acquarossa. Four main streets, each 15 meters wide, defined the habitation area of Marzabotto. One north-west street ran the length of the town, and three east-west streets crossed it. Minor streets, each 5 meters wide, ran parallel to the main north-south axis, creating rectangular blocks. Marzabotto’s city blocks were filled with mudbrick houses and workshops. Craft workshops- including pottery and tile kilns, iron smithies, bronze foundries, and smelting furnaces-faced the street. Living quarters were located in interior courtyards, reached through narrow passageways. Each courtyard had a cistern to collect rainwater running off the tiled roofs. Archaic period cemeteries reflect the development of new “middle” classes. Whereas cemeteries of the previous period comprised many humble tombs and a few dominating tumuli, Archaic period cemeteries consisted of many simple, uniform tombs laid on streets. Examples of Archaic cemeteries include the Banditaccia at Cerveteri and Crocefisso del Tufo at Orvieto, both from the sixth century BC. The streets of Crocefisso del Tufo were laid out in a grid during the later sixth century, and the cemetery was used throughout the fifth century BC. The small, rectangular tombs were constructed from tufa stone blocks. Their chambers usually have two stone benches for deposition of the dead. The roofs are made of stone slabs and covered with a modest mound and small stone markers (cippi). A Classical period house interior is re-created in the Tomb of the Reliefs, from the Banditaccia necropolis at Cerveteri, built at the end of the fourth century BC. The underground tomb was carved from tufa stone; then a stucco surface was applied to the walls and painted. The original owners, a married couple, were represented lying side by side in bed. They are surrounded by relief stucco representations of everything they might need to keep house: utensils, tools, vessels, and even a gaming board. The power of the husband, a magistrate, is indicated by his ivory folding chair, trumpet, and weaponry. 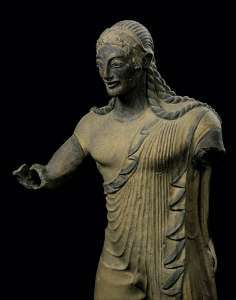 During the Archaic period Etruscans continued their own distinctive religious practices, although Etruscan divinities were assimilated with the Greek Olympian gods. Again influenced by the Greeks, Etruscans also began building monumental temples. The Temple of Minerva at Portonaccio, Veio, was constructed in the mid-sixth century BC and rebuilt at the end of the century. The Tuscan-style temple is oriented to the east, facing a paved piazza. It has a square plan, each side approximately 18.5 meters. The temple was built on a low podium. Steps at the front of the temple led to a deep porch, or pronaos. The pronaos had two columns with Tuscan capitals; beyond it was placed the sacrificial altar and a sacred pit where libations to the underworld divinity were poured. At the back of the temples were three cellae, or rooms, side by side. The foundation, walls, and columns of the Temple of Minerva were built of tufa stone blocks. The wooden roof was decorated with terra-cotta sculpture, a famous product of Veio. The revetments were graced with floral ornamentation; the antefixes included heads of nymphs and masks of the Gorgons, the snake-haired sisters of Greek myth. Painted terra-cotta statues, larger than life size, were placed on the roof ridge. The famous statue of Apollo (now in the Etruscan Museum of Villa Giulia, Rome) probably aimed his bow at Heracles, representing the Greek myth of their conflict over the golden-horned hind of Ceryneia. Etruscan monumental sculpture typically was executed in terra-cotta or bronze. The Etruscan city of Cerveteri was famous for its terracotta sculpture during the Archaic period. 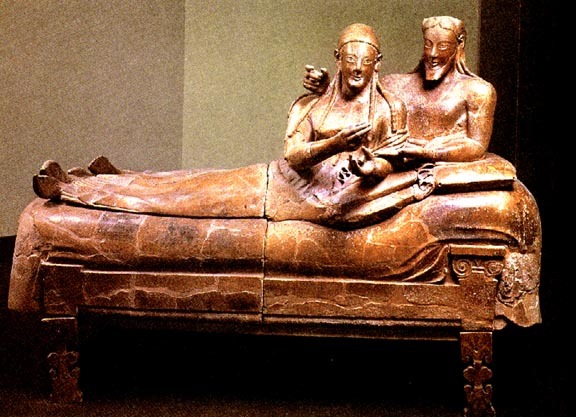 One well-known example is a sarcophagus depicting a married couple reclining on a bed, placed in a chamber tomb beneath a tumulus in the Banditaccia necropolis around 525 BC. The husband lies behind his wife, placing his hand on her shoulder. She pours scented oil onto his palm, a rite for the deceased. 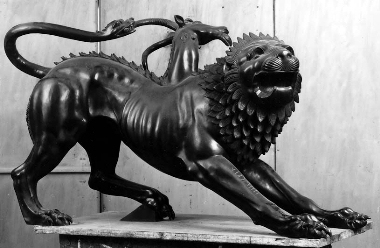 The statue of the Chimera (now in the Archaeological Museum, Florence), is a fine example of Etruscan bronze sculpture. The Chimera was a mythological fire-breathing creature with the body of a lion and heads of a lion, goat, and snake. In this representation, the creature is wounded, suggesting that the statue may have been part of a group that included the hero Bellerophon and his winged horse Pegasus. The statue (or group) probably was created as a votive offering in the late fifth century or early fourth century BC. Tarquinia was the main center of tomb painting during the Archaic period. The rock-cut tombs from the Monterozzi necropolis are small, rectangular chambers with shallow ridge roofs. After about 530 BC brightly colored paintings covered entire walls of the chambers. The paintings showed mythological scenes, funerary games and ceremonies, banqueting and entertainment, sports, and scenes of the underworld. The Tomb of the Leopards, from the early fifth century BC, is a vibrant example. The Etruscan economy became increasingly specialized and intensified during the Archaic period. New socioeconomic classes emerged, based in the great city-states and trading towns: manufacturers, crafts producers, and merchants. Internal trade throughout Etruria was effected via coastal waters, rivers, and roads. Long-distance trade was completed in emporia, or trade towns, along the Etruscan coastline. Bronze ingots dating to the early Archaic period probably were used as currency in long-distance trade. Pottery and metalworking remained important Etruscan industries during the Archaic and Classical periods. Early in the Archaic period the Etruscans created their own versions of red figure pottery, modeled after the famous Greek products. 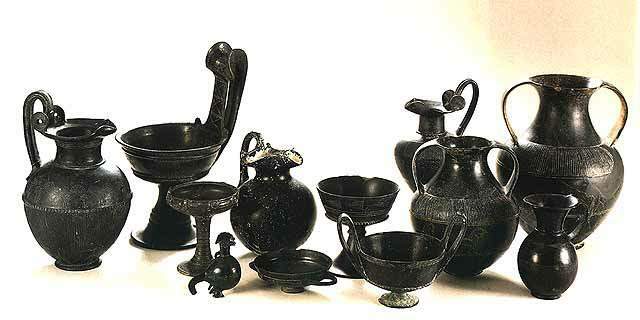 Beginning in the fourth century BC a distinctive Etruscan product dominated the pottery industry: tableware coated with a glossy black slip, and decorated with stamped and modeled (relief) motifs. Workshops at Vulci and other Etruscan cities worked bronze into chariots, weapons, armor, vessels, and other utensils. Precious metals, such as gold, were made into jewelry. Etruscan society changed greatly during the Archaic period. Cities and trade towns supported the growth of new socioeconomic classes- merchants, manufacturers, foreigners-that were not bound by traditional patron-client relationships. These new groups shared common political and economic interests that were at odds with the interests of the established Etruscan aristocracy. Their growing influence and power contributed to the dissolution of the traditional Etruscan social system. The Etruscan period begins around 700 BC, when the first surviving historic documents were written in the Etruscan language. Etruscan society evolved directly from the prehistoric Iron Age. Many of the most characteristic features of Etruscan society- settlement in towns, distinctive cultural customs, production of goods for regional and long-distance trade and exchange-were present in incipient form during the Iron Age. Early Etruscans also were influenced by the Greeks, Phoenicians, and other contemporary Mediterranean societies. The Orientalizing period (700-575 BC) is named for the imported goods and foreign styles adopted by the Etruscans during this time. The early Etruscans’ economic power was based on mineral and agricultural resources, which they transformed into goods for exchange. They cut a dashing figure across the Mediterranean, renowned for their seafaring skills as traders and pirates. As reflected in their art, monuments, and historical documents, Etruscans of the Orientalizing period were prosperous and cultured. The Orientalizing period saw the transition from village to town life in Etruria. Excavations in Etruscan towns of this period have revealed signs of urban planning and public works, such as streets, drainage channels, reservoirs, retaining walls, fortifications, and sanctuaries. Volterra, in northern Etruria, became a small, fortified settlement at this time. In the seventh century BC, the numerous villages on the Volterran hilltop agglomerated into a single town. In the sixth century a circuit of walls was built to enclose the town, and sanctuaries were demarcated throughout the city. Differences among dwelling and burial types were accentuated, indicating that an aristocracy of prominent families had formed. A similar type of urban development occurred in many other cities in Etruria and Latium (modern-day Lazio), including Roselle, Veio, Vetulonia, and Tarquinia. Across Etruria there was a significant change in domestic architecture during the Orientalizing period. Stone houses, presumably elite residences, appeared among the thatched huts. Excavations at Poggio Civitate, near Murlo, have uncovered the remains of a princely residence built during the seventh century BC. The complex at Poggio Civitate was built of rubble foundations, earthen walls coated with lime plaster, and beaten-earth floors. The roof was tiled and decorated with terra-cotta sculpture. The buildings were placed in a U shape around a central courtyard. Two wings of the complex were residential, while the third served as a workshop for crafts made of metal, glass, pottery, wool, and other materials. A fire destroyed the Orientalizing period residence, and a second complex was built at Poggio Civitate in the early sixth century BC, or the beginning of the Archaic period of Etruscan history (575-470 BC). The early Archaic building surrounded a central courtyard, with colonnaded porches on three sides. At least twenty-three statues stood on the peak of the roof, including the famous seated “cowboy” figure, with his distinctive hat. Watchtowers were located at two corners of the complex. Cemeteries surrounded Etruscan towns. Early cemeteries were placed next to hilltop settlements; as town populations grew during the Orientalizing period, burial areas spread down the hill. The rock-cut Tomb of the Five Chairs at Cerveteri, dating to the second half of the seventh century BC, provides some insight into burial rites of the time. The main chamber of the tomb held two bodies, while a side chamber provided space for mourners to worship an ancestor cult. Five chairs were carved from rock to hold terra-cotta statues representing ancestors, two women and three men. The ancestor statues sat before rock-carved tables laden with food offerings. A nearby altar held their drinks. Two empty chairs allowed the buried couple to join their ancestors at the feast. By the seventh century, burials show clear evidence of status differentiation according to gender, socioeconomic status, and region. While existing burial traditions continued, during the Orientalizing period the elite classes began building elaborate chamber tombs covered with tumuli (mounds). Chamber tombs were carved out from soft volcanic rock faces or built from stone slabs or blocks. Their mounds could be as large as 30-40 meters in diameter and 12-15 meters high. A particularly grand example is the Tomb of the Chariots, Populonium, from the middle of the Orientalizing period (midseventh to early sixth century BC). Under a tumulus 28 meters in diameter, the tomb contained funerary beds for four occupants. At least one woman, with gold jewelry, was buried in the tomb. She was accompanied by men, who were provided with a chariot and two-wheeled carriage. Traditional Etruscan worship in open-air sanctuaries continued during the Orientalizing period, but new religious practices also arose. Influenced by Greek ideas, Etruscans began using enclosed structures for worship and representing gods in human form. The earliest known temple in Etruria, built around 600 BC, was excavated at Veio. It took the form of a large house; a distinctive architectural form would not be developed for Etruscan temples until the Archaic period. By the Orientalizing period the Etruscan agricultural system was specialized and intensified, allowing farmers to support the growing town population. Drainage and irrigation techniques improved poor land, and new farming technologies, such as ironclad wooden plowshares, allowed farmers to work more efficiently. Farmers exchanged their surplus subsistence and luxury foodstuffs for craft goods. Craft production became increasingly specialized and intensified during the Orientalizing period. Etruscans were adept at numerous arts and crafts, including pottery, metalworking, and sculpture. Technological improvements, learned from the Greeks, transformed Etruscan pottery production. Potters purified clay, built vessels on the fast wheel, and fired them at high temperatures in closed kilns. As production became more specialized and intensified during this period, pottery forms were increasingly standardized and distributed in a wide area. Bucchero, a kind of tableware with a distinctive gray core, glossy black surface, and stamped or molded decoration, was a famous Etruscan pottery product of the Orientalizing period. Other fine pottery wares included black figure vase painting, produced locally after eastern Greek models. Metalworking remained an important industry at this time. Bronze was worked into vessels, utensils, armor, furniture, chariots, and carriages. Metalwork ornamentation was inspired by eastern styles, incorporating floral patterns, animals, humans, and divine figures. Etruscan bronze products were exported widely, throughout the Mediterranean and beyond the Alps. Etruria also was famous for jewelry production, particularly ornaments decorated with gold granulation (using fine beads of gold) and filigree (using fine spiral gold and silver wire). Etruscans probably learned these techniques from the Syrians or the Phoenicians. Trade grew steadily. Beginning in the eighth century, Etruscans had extensive trade contact with eastern Mediterranean cultures, notably Greece and Phoenicia. 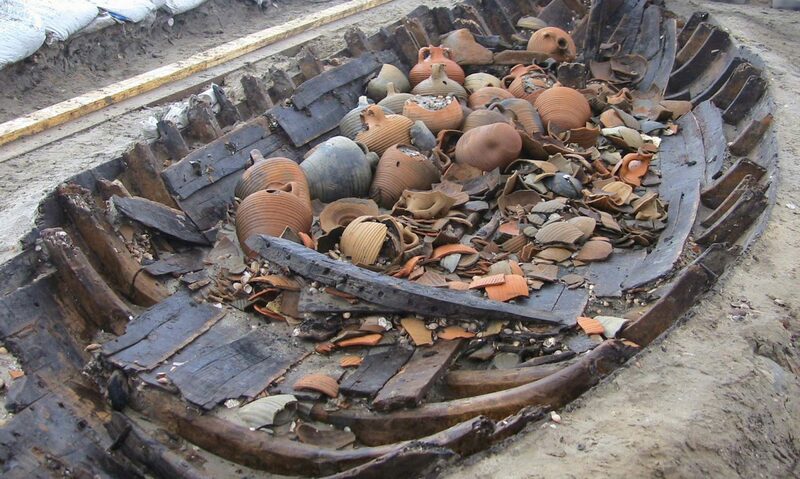 Recovered shipwrecks were loaded with Etruscan trade goods: pottery and other crafts and amphorae filled with agricultural products, such as pine nuts, wine, and olives. In exchange, the Etruscans imported the eastern luxury goods found in such abundance in aristocratic graves. Etruscan trade was not administered centrally. Instead, many small political units, controlled by the elite, competed on more or less equal terms. The Greeks also established trade towns on the coast of southern Etruria, and Greek craft producers settled permanently to work in Etruria.